Send your belongings to University of Wisconsin-Madison with My Baggage! My Baggage is the No.1 College Shipping company for the University of Wisconsin-Madison. We help thousands of students transport their belongings to and from college every single semester. We provide a reliable and low-cost shipping service for students! UW-Madison is located in Madison, Wisconsin and was founded in 1848. An interesting fact is that one in every 790 living Americans has at least one degree from UW-Madison. Another fun fact is that the UW-Madison marching band members started wearing their caps backward after a Badger win in the 1920s to symbolise ‘looking back’ at their victory. 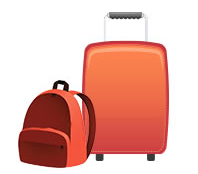 At My Baggage, we aim to make your move to college as easy and as stress-free as possible. Forget hauling your suitcase or heavy bags from home and through train stations and airports; our convenient luggage shipping services are the perfect solution. Booking with us is easy. Our online booking system is available 27/4 and it takes just a few short moments to complete. Simply start by obtaining a quote online. Once you’ve booked your shipment, we’ll send you shipping labels to print and attach to your items. After that, you can sit back and relax as we collect your shipment and deliver it straight to where it needs to go! You can arrange everything from the comfort of your own home. My Baggage offers convenient door to door collection and delivery services within the US, UK, across Europe and to over 200 countries worldwide. That means there’s no need to leave your stuff off at a drop-off point and no need to venture out to collect it. If you are living in dorms on the UW-Madison campus, items will be collected from and delivered to the main reception area or designated mail room. However, we do recommend that you double-check this with your college before booking with us. At My Baggage, we understand that the very last thing you want when moving to college is to be without your personal belongings for a long period of time. That’s why we offer super fast delivery times of approximately 3 working days. We offer Express services domestically and internationally – so you don’t have to be without your items for long. My Baggage offers £100 free compensation cover on every single shipment. You will be given the option to increase this value right up to £1,000 for a small additional fee during the booking process, if you wish to. Before choosing your cover, we recommend having a read through our list of prohibited and non-compensation items. If you are an international student travelling to study at University of Wisconsin-Madison, My Baggage can help you transport your belongings there without any added stress! My Baggage is a much more affordable option than paying for an extra bag on your flight. We ship to over 200 countries worldwide and offer a generous weight limit of 30kg – so you don’t have to leave behind anything important. We can help you get your luggage to your new home at UW-Madison quickly, safely and all for a price you can afford.